I did it! I visited the world's most isolated and closed off country! North Korea or Democratic People's Republic of Korea (DPRK) has distanced themselves from the outside world since the split of Korea in the 1950's. Sharing borders with both China and Russia it's no surprise, that communist influence helped form the country into what it is today. Ruled by the Kim-family for three generations DPRK consider themselves a state-run socialist government. Before we move on keep in mind that; discussing DPRK will always have at least two sides to a story - the one I'm telling here is purely based on a traveller's point of view. You'd think that visiting the world's most closed off country would be practically impossible, but when it comes to getting there - it wasn't nearly as difficult as you'd expect. I would like to note however, that backpacking DPRK is impossible. I accessed the DPRK through China. I touched down in Beijing, as I where told I needed China visa to enter DPRK. DPRK has their own airline - Air Koryo - a single star rating makes them the World's worst rated airline. Inside the seats had a fitting red color and during the whole flight, a propaganda concert were playing on the overhead screens. The stewardesses were English-speaking, very helpful and dressed nicely - all with a Kim-pin stuck to their uniform. 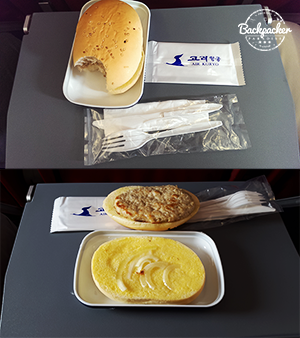 Unexpectedly they even served a meal during the one-and-a-half hour flight. A hamburger of some sort, not a hot meal, but still a quite decent snack meal. 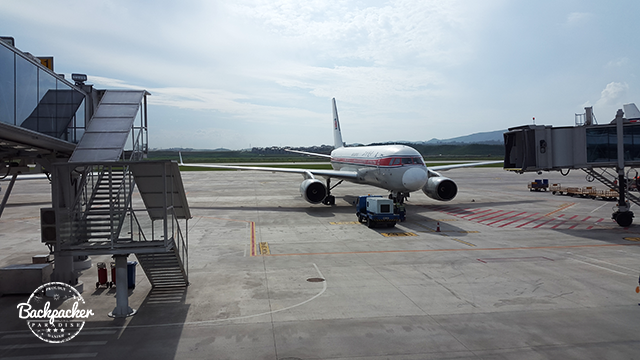 We arrived at Pyongyang airport safely and I can truly say; I most definitely have experienced worse service, food and in general worse flights than the one I had with Air Koryo. After the very different security check, the three local guides that would be with me for the next 8 days greeted me with great hospitality. 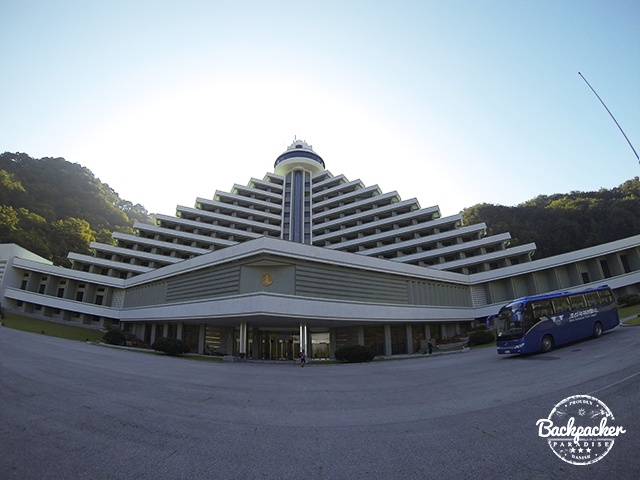 We drove straight to Yanggakdo International Hotel, located on Yanggak Island in the middle of Taedong River inside capital city Pyongyang. As a foreigner in DPRK there's not a lot of choices when it comes to accommodation. To be fair there isn't a choice at all, but you will most likely be placed in Yanggakdo or Koryo Hotel. Besides housing the reception, the ground floor at Yanggakdo has high-polished marble floors, enormous flower pots, bars, restaurants, a book shop, a post office, a minor grocery store, a souvenir shop, six lifts and last but not least an aquarium holding sturgeons and an ultra rare flatback sea turtle - not a sight that endorses me. In the basement you can have a game of ping pong or bowling, challange your friends or guides to a karaoke battle, have a swim in the pool, spend your money in the casino, get a massage, haircut or manicure or have a tailor-made Kim Jong Il suit fabricated within a few days. On top of the 47-story building you'll find the Revolving Restaurant. That's IF you can find it. Only two of the six lifts go there and when there's a power-out the 47th floor is not accessible. Using the lifts in general is quite a challenge and it takes both skill and luck to reach the different floors. There are staircases, but some floors are closed off. From 43rd floor and up the stairs are not accessible and 5th floor is sealed off completely and has no button in the lifts as well..
Breakfast is served at the hotel every morning consisting of rice, kimchi (cabbage with chili), vegetables, fish, toast bread with butter and jam. On a last note Yanggakdo International Hotel has a stunning view from the hotel rooms - asking for a room on a higher floor level is definitely worth it. I also stayed one night at Hyangsan Hotel near Mt. Myohyang. Hyangsan is even more luxurious than Yanggakdo and the group I traveled with were the only ones to stay in this outstanding hotel. Both the food and the rooms were better compared to Yanggakdo. The dinning hall looked like a cut-out from Cinderella. The view great, but not quite as stunning as Yanggakdo. The third place I spend a night was in Kaesong near the border to South Korea. 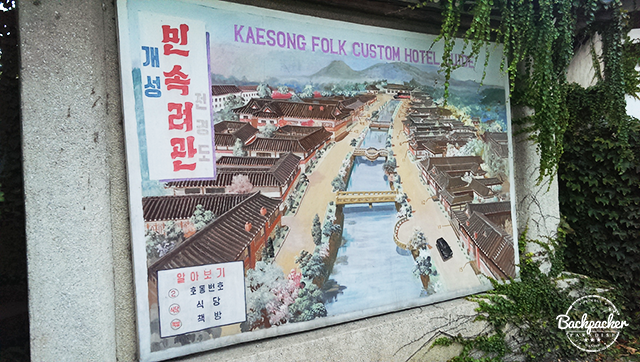 Kaesong Folk Custom Hotel was completely different from the others. A traditional Korean (or Koryo) inspired hotel and quite the experience. Sleeping on the floor in small huts which were gathered in groups like miniature communities. Both dinner and breakfast was also on the floor by long tables. During the evening we hit the bar with the local guides, drank beer, played cards and danced. Just 8 kilometers from a war zone - what a contrast. Writing about places to visit almost doesn't matter as your tours outside the hotel will be planned completely by your local guides. However suggesting places to the guides is possible, but it's not certain they will or can take you. 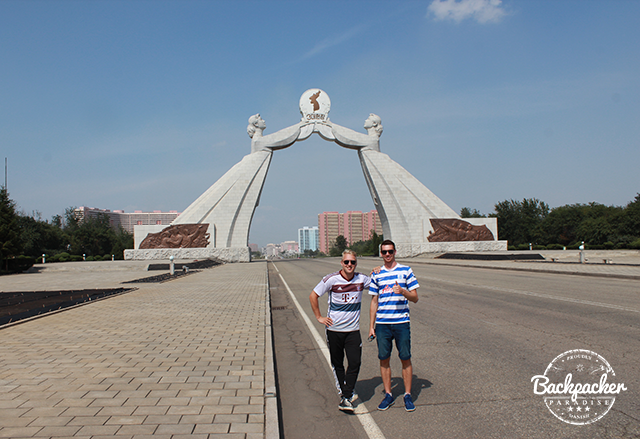 Arch of Reunification above Reunification Highway in the outskirts of Pyongyang. 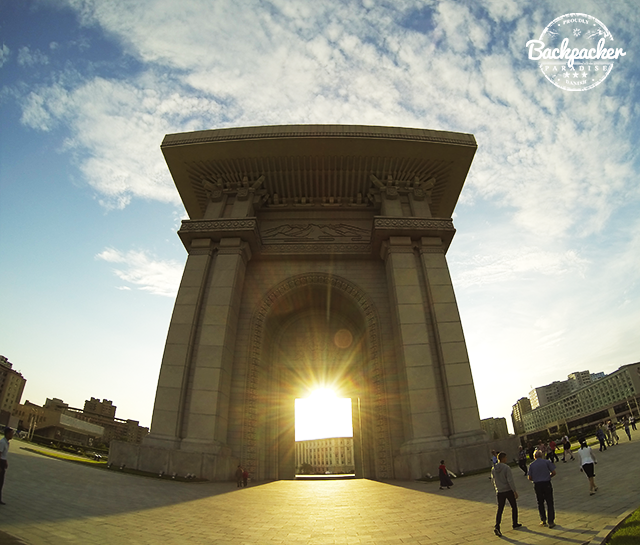 The arch was finished on August 2001 to commemorate Korean reunification proposals put forward by Kim Il-Sung. The two traditional dressed Korean women symbolized the North and the South as they lean forward to uphold a sphere between them. The sphere has a map of a united Korea on it. Visits here are quite rare. 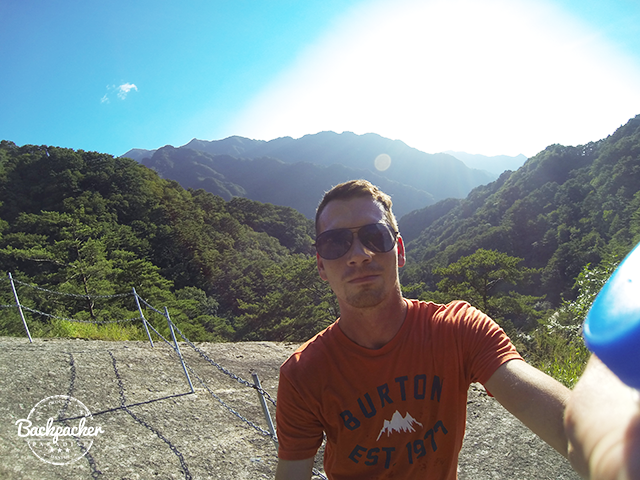 Asking your local guides for a quick "photo-stop" here will definitely increase your chances though. Kumsusan Palace of the Sun (formerly Kumsusan Memorial Palace) located in the northeast corner of capital city Pyongyang. 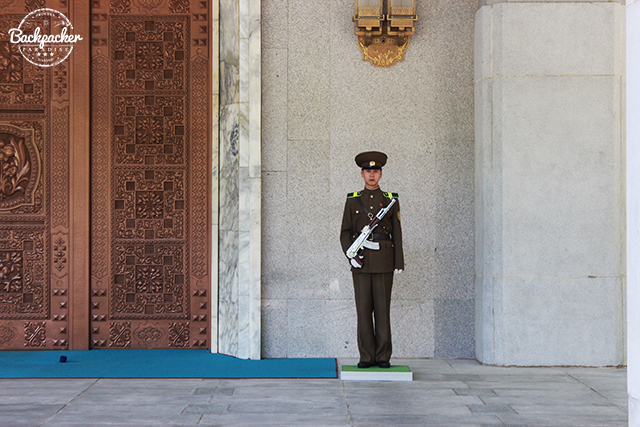 The palace serves as the mausoleum for Kim Il-Sung and Kim Jong-Il. Inside lies their embalmed bodies in clear glass sarcophaguses. 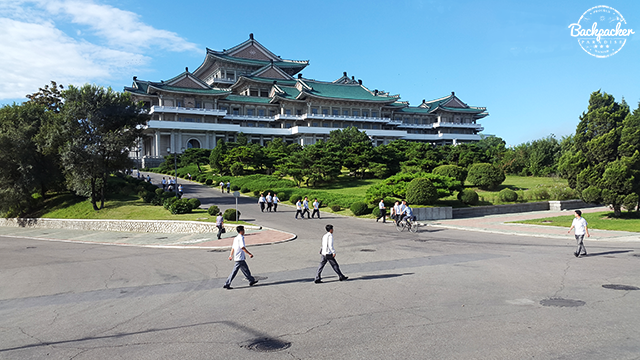 Until Kim Il-Sung's death in 1994 the palace was used as the official residence, upon his death it was renovated and transformed into a mausoleum. During a visit to the mausoleum it is extremely mandatory to wear formal clothing. Suits for men are an absolute must, if you want to enter the palace. Inside it's strictly forbidden to take photos and you wont have more than just a few minutes in there. It's also mandatory to bow for both Kims. The second tallest Arch of Triumph in the world (the highest being Monumento a la Revolución, Mexico) standing 60 m high and 50 m wide. 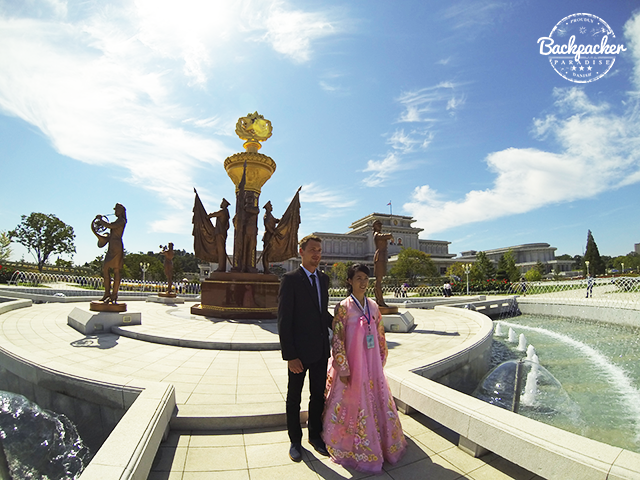 It is located on Triumph Return Square at the foot of Moran Hill in capital city Pyongyang. And was built in 1982 to honour Kim Il-Sung's role in the Korean military resistance to Japan from 1925 to 1945. Mansu Hill Grand Monument consists of several monuments. 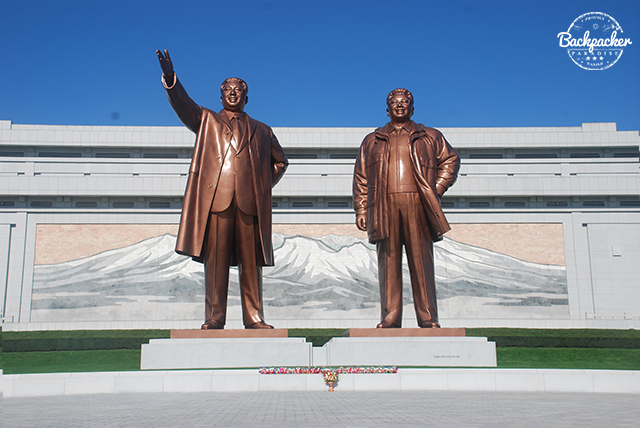 The central part however being two 22 m high statues of Kim Il-Sung and Kim Jong-Il. Both statues are made of bronze, but was built 39 years apart (1972 and 2011). On the wall of the Korean Revolutions Museum behind the statues is a mosaic mural displaying a scenery from Mount Paektu. On each side of the statues are two monuments of different soldiers and workers. 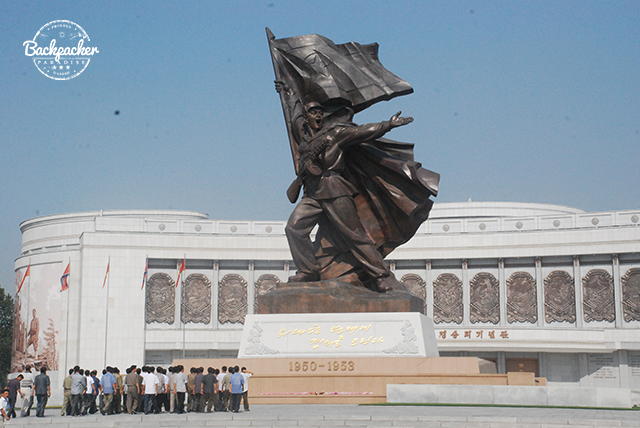 Every tourist visits the Grand Monument as it is the absolute top attraction of Pyongyang. Leaving flowers and the foot of the statue and taking a bow before them is mandatory. Photos taken here has to follow strict rules; the statues must fit in the frame, no selfies, no poses etc. Korean Worker's Party Monument (also known as Monument to Party Founding) is situated on Munsu Street in the Taedonggang District of Pyongyang. The monument shows the hammer, the calligraphy brush and the sickle representing workers, intellectuals and farmers. It stands 50 m high symbolizing the 50-year anniversary of the Korean Workers Party. The inscription on the monument translates to: "The organizers of the victory of the Korean people and the leader of the Workers Party of Korea!". Stops here are quite rare. Unfortunately (despite several requests) I didn't get to go here. I snapped a photo as we passed by driving to other attractions. Victorious Fatherland Liberation War Museum was originally located in the central district of Pyongyang, but was moved to the Sosong district on April 1963. The main attraction is the US Navy Ship, USS Pueblo, which was captured by North Korean forces in 1968. As a visitor you're allowed to board the ship. Exhibitions also include statues, murals, several American airplanes, helicopters, tanks and other military vehicles and a 360-degree diorama of the Battle of Daejon. The museum also features a small book shop, where you can acquire a piece of North Korean history translated to English. Juche Tower or The Tower of Juche Ideas is an accessible tower in Pyongyang named after the Juche ideology which was introduced by Kim Il-Sung. 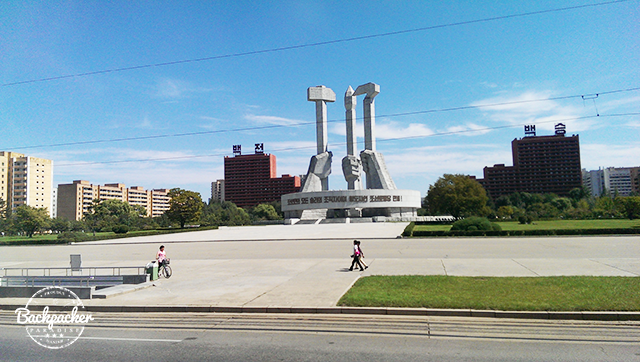 Completed in 1982 to commemorate Kim Il-Sung's 70th birthday. Standing 170 m high the most stunning thing about this is the view over Pyongyang as you ascend the tower by elevator. Mangyongdae Native House (Kim Il Sung's Birthpalce) is a rural house where Kim Il-Sung supposedly grew up. The humble thatched house is surrounded by well trimmed bushes and neatly mowed lawns. The house is divided into several living rooms and a barn. Several objects used by Kim Il-Sung and his family are on display. Next to the house there is a well, it is said that drinking from this well will gain you wisdom and strength. 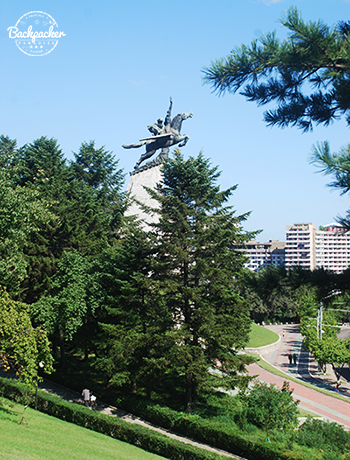 The Chollima Statue located on Mansu Hill in Pyongyang symbolizes the "Chollima speed". Chollima literally means "thousand-mile horse". The mythical winged horse originates from China and is commonly portrayed in East Asian culture. Chollima speed is an ideal North Koreans should follow in both work and war. The statue can be spotted from Grand Monument if you go to the far right. Revolutionary Martyrs' Cemetery is a memorial to honor North Korean soldiers fighting for independence against the Japanese rule. 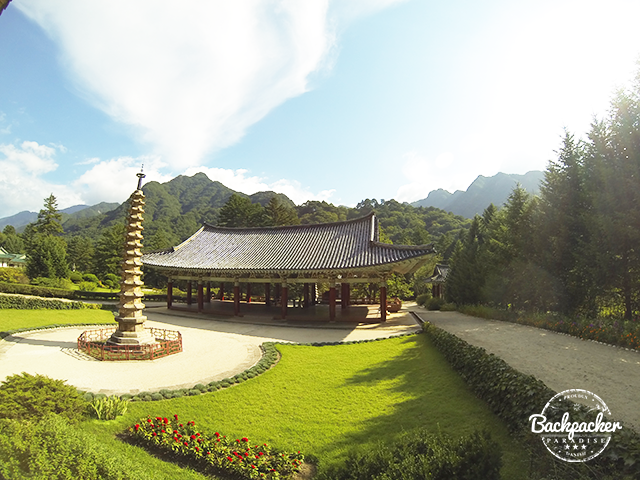 It's located on Mount Taesong in Taesongsan just outside Pyongyang. The cemetery has hundreds of tombs. Both Kim Il-Sung's wife and mother are buried here. 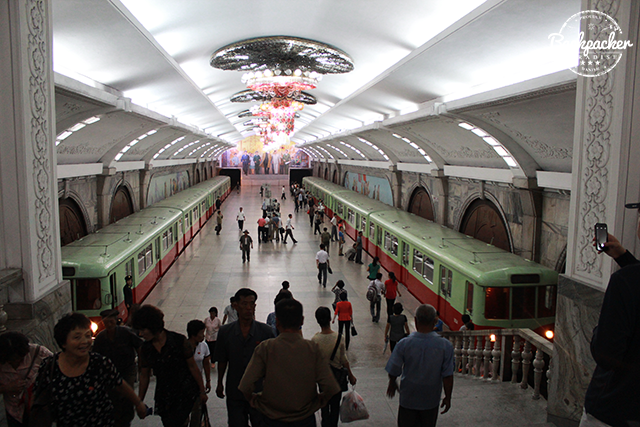 Pyongyang Metro is among the deepest metros in the world. Previously there was only limited tourist access to the metro (2 stops) which lead to conspiracy theories that the metro was purely for show with actors pretending to be passengers. This has however been proven wrong since. Two full lines run in the metro system and we rode the train several stops. The different stations are widely decorated with statues, murals, paintings and enormous chandeliers. Grand People's Study House is the central library in Pyongyang. 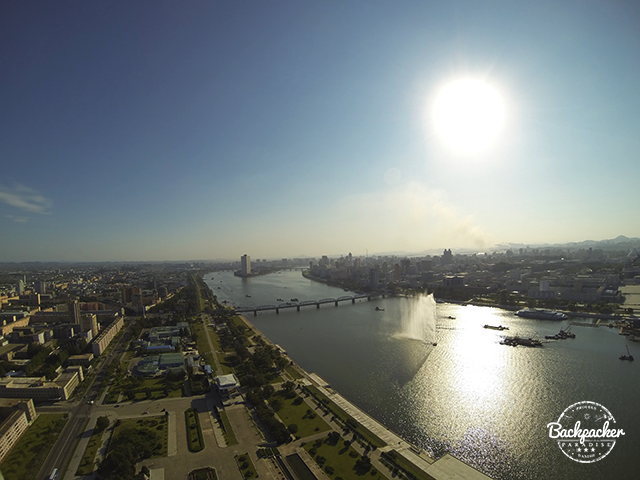 The building is situated on Kim Il-Sung Square and from the balcony you'll have a great view over the square towards Taedong River and Juche Tower. The study house itself has numerous computer rooms providing access to the North Korean intranet. The locals with a library membership can also listen to music. 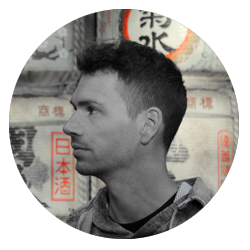 We asked our guides to listen to the newest Western music the library could provide us with. They handed us The Beatles. Well played North Korea. Well played. The Hiking Trails on Mt. Myohyang are simply wonderful. Stunning views, green trees covering the grey mountain rocks and water running down creating small waterfalls every now and then. 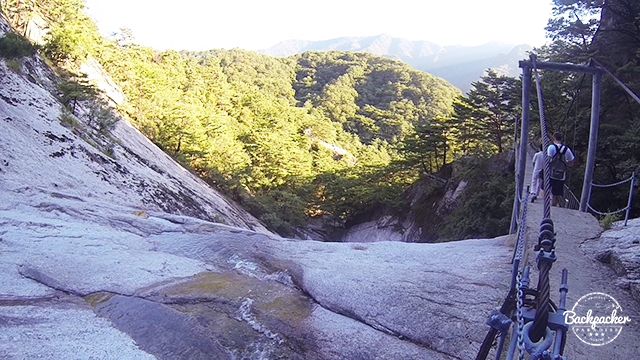 We reached the mountain during midday and for the first time on the trip I felt free. The local guides tried to follow us, but the group split up as we climbed the peaks at different paces. The sun was burning hot and it didn't take long to soak my shirt. Neither my sore legs nor the burning sun could take away that returning feeling of freedom I felt on Mt. Myohyang. Guarded by military personnel with silver covered AK-47's and carved deep into the mountains protecting it from bombings lies the International Friendship Exhibition close by Mt. Myohyang. The collection of gifts Kim Il-Sung and Kim Jong-Il has received greatly exceeds what our whole Royal Danish Family has ever received. The collection includes a stuffed alligator dressed as a butler, several cars, two trains and an airplane. No pictures allowed inside unfortunately. The last place near Mt. Myohyang worth mentioning was the buddhist Pohyon Temple. As I've traveled around Asia quite a lot and seen my fair share of Buddhist temples it was 'just another temple' for me. But in DPRK a temple like this seems more out of place for some reason. 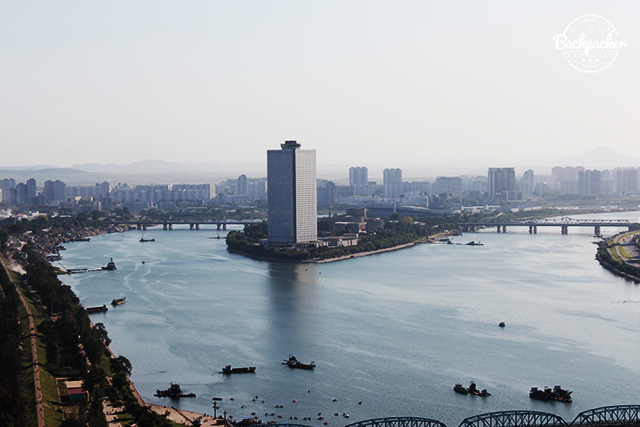 Nampo is located on the west coast of DPRK and is considerably the largest harbour city in the country. Driving through Nampo it didn't seem too active considering it's the main harbour. 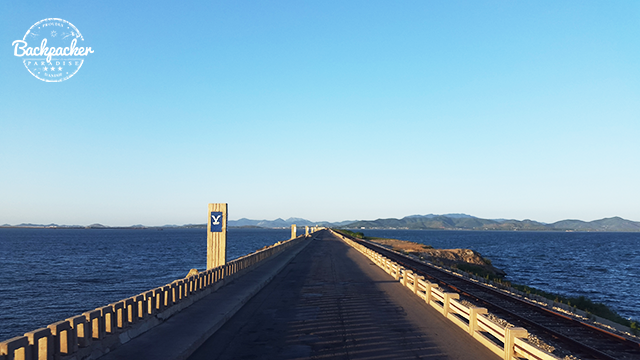 The most interesting place was outside Nampo where the Koreans have built the West Sea Barrage. An 8 kilometers long system of dams dividing salt and fresh water, resolving water supply problems and allowing farmers to water their fields. At the end of the barrage a memorial monument were built. A lighthouse in the shape of an anchor stands tall and directs ships into the lock chambers were they can pass through the barrage. 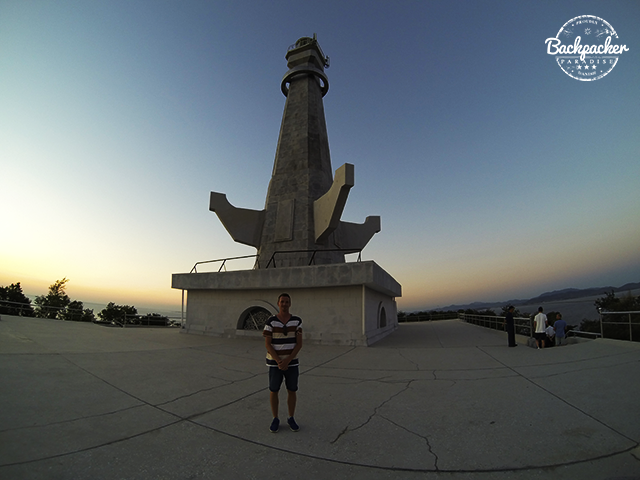 Luckily we reached the lighthouse just minutes before sunset. 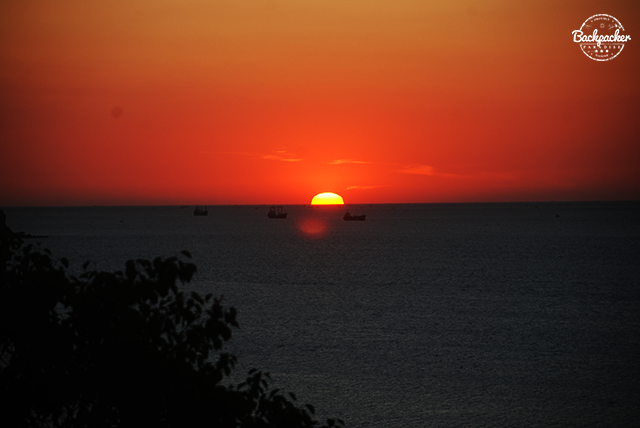 The drowning sun in the Yellow Sea must be one of the most beautiful sunsets I've witnessed so far. Kaesong is an ancient city in Koryo history. Visiting The Tomb of King Kongmin and understanding Koryo culture at Koryo Dynasty Museum was schedule by the local guides. By far the most interesting during my trip to the border was going through the Demilitarized Zone (or DMZ for short). Passing the security points and and arriving at the Joint Security Area (JSA) was emotionally absurd. JSA also called "True Village" is the only part of DMZ were North Korean and South Korean soldiers are forced to stand face-to-face. JSA is also where negotiations takes place - inside the blue barracks. On the south side we could see other tourists visiting this highly tensed area. 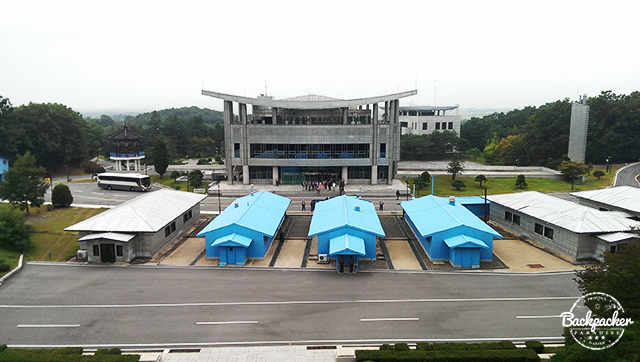 Truce makes it possible to visit 'the front line' inside DMZ. 24 kilometers east of Kaesong a North Korean Colonel guided us to the front line with views across the border to South Korea. 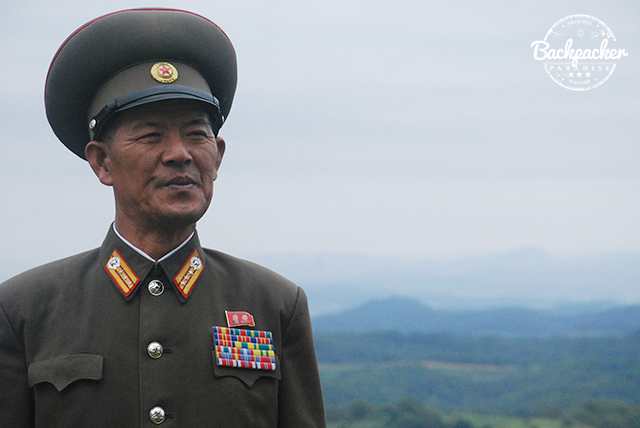 All military personnel in DPRK are of great significance. Highly ranked war personnel gain pride and honor above other professions. 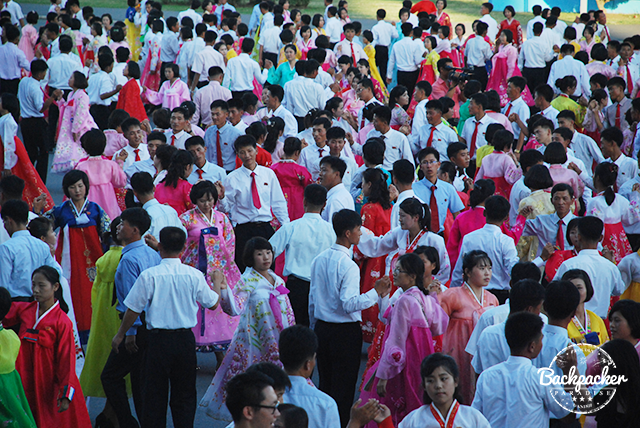 During my visit to DPRK celebrations for National Independence Day (September 9th) took place. Unfortunately the world famous Mass Games did not take place this year. However I spend the day in Moran Hill Park. There, locals hang out in their spare time - and on September 9th the park is full. 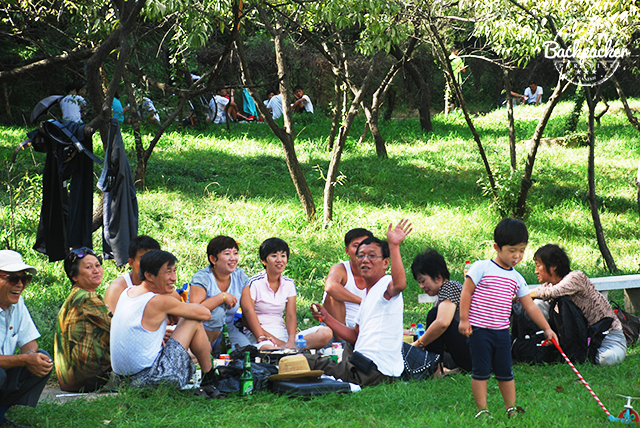 Walking among the many North Koreans were an unexpectedly social activity as the locals welcomed strangers like me with waving, food, drinks, dance, songs and and smiles. 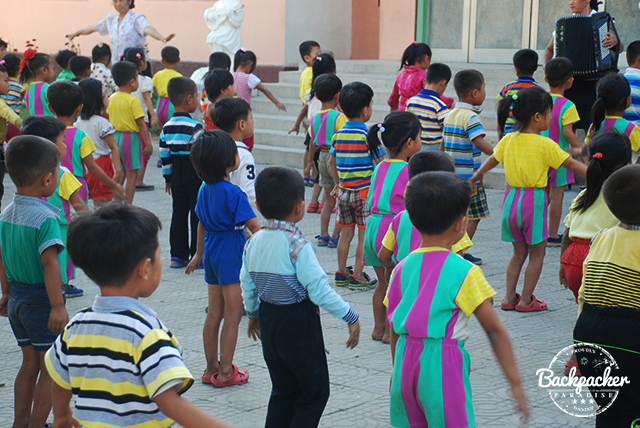 In the evening I went to a Mass Dancing meet-up - arranged due to the National Day of DPRK. The women were wearing their national costume. The men their finest suit. The dance itself reminded me of traditional Danish folk dancing - even though I've never seen Danish folk dance being that well organized and executed. My visit to Munsu Water Park in Pyongyang was surreal. DPRK is in desperate need of resources and economically stability. Yet in November 2013 the newest addition to overwhelming entertainment in Pyongyang was opened. 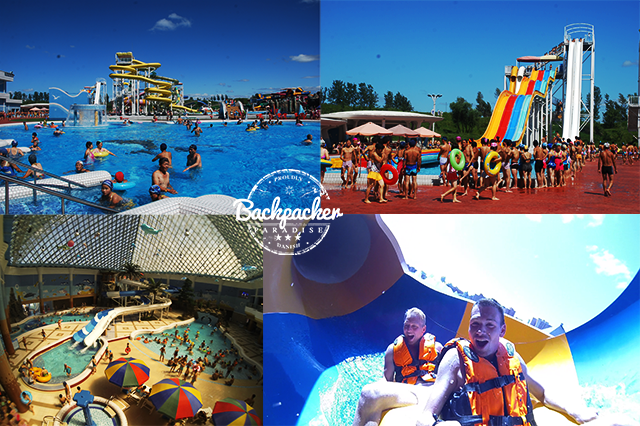 The water park has indoor and outdoor areas with several water slides, different pools, volleyball courts, ping pong tables, trampolines, a fitness center, cafes and restaurants, a hairdresser and a rock climbing wall. On the day of my visit, the park was full. A sunny day had attracted several groups of people from the upper class of society. Outside the main entrance 'Entry of the Gladiators' are being played through loudspeakers. Entering the lobby hall, a 3-D wax figure of Kim Jong-Il stands on sand with a beach as background - no photos allowed, but a bow is in order. As a foreigner you'll have a separate cashiers from the locals - 10€ for foreigners. I was told that the locals pay the same amount, but I saw no exchange of money at the ticket desk for locals. 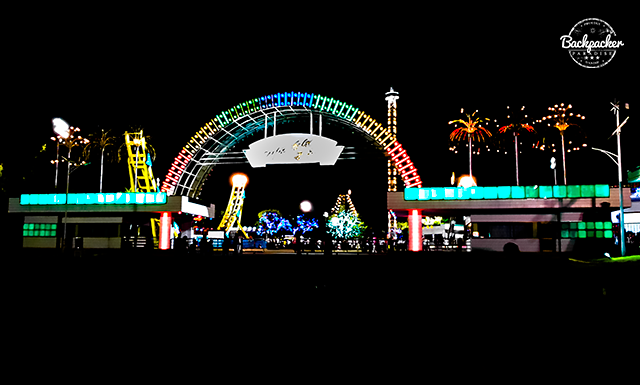 The newest addition and the fourth amusement park in Pyongyang is Kaeson Fun Fair. The entrance was just 3€. The prices of the different rides ranged between 2€ and 5€ - but for that price you'll skip the lines of local Koreans waiting their turn. The big roller-coaster and the bumper cars were some of the highlights. A fun hour or two spend in Pyongyang - seeing the Koreans and most interesting of all; catching the local guides off-guard as they cut themselves loose. The school for the best and brightest; School Children's House or simply Children's Palace. Walking from classroom to classroom where students are waiting to give a short performance before entering the concert hall. Here a strictly organized performance takes place. Kids and teenagers sing, dance, act and impress as they show how hard work pays off. In the area of Blue Mountain lies a cooperative farm. A self-sufficient society with fields, greenhouses, a school and a kindergarten. The kindergarten was by far the most thrilling visit. First we got some fruits and candy for the young ones. Arriving we got greeted with a bow worthy of a Kim. Singing and dancing were once again put together in a show, where the young Koreans integrated us and made us take part. What hit me the most was the innocence of the kids. Standing there holding hands with a kid girl and seeing those dark big eyes - I felt like leaving all my stuff behind and fill my backpack with as many kids as possible. There is a cultural gab between Denmark and the DPRK with the size of earth itself. I could write books and make movies about how different things are run. Picking out just a few, traffic, would most definitely be on my list. 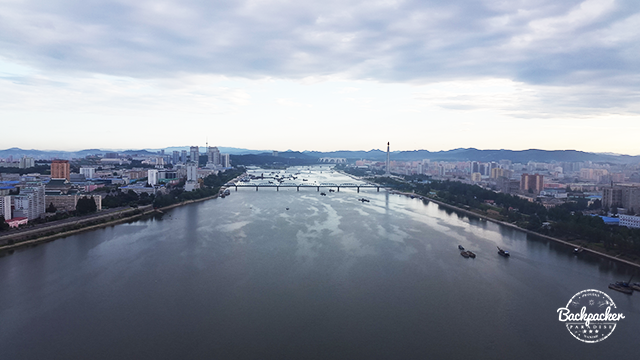 As electricity is an inconstant factor even in Pyongyang, so are the intersections. Replacing the traffic lights, the North Korean government has hired traffic women (and rarely traffic men) to direct and conducts traffic. However, due to lack of gasoline and the fact that import is practically limited to the Chinese market - a car is not a household item in the DPRK. Heavy traffic is a rare occurrence. A bicycle costs 3 annual salaries for a high class worker in Pyongyang. Understanding the DPRK way of thinking can be quite difficult. DPRK's population still sees Korea as one country - temporarily split. Referring to their country as 'North Korea' is considered rude and offensive. 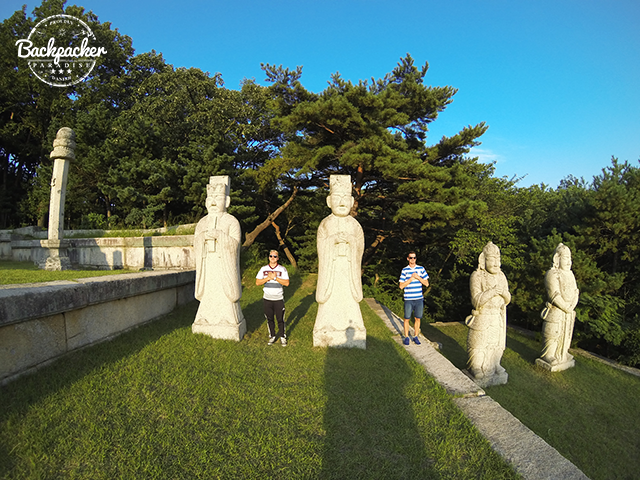 'DPRK' or simply 'Korea' will definitely please your local guides and earn you some trust. Their history differ vastly from ours and correcting information will get you nowhere. The simple rule is to keep your mouth shut unless you've got something positive to say. Taking photos is not allowed everywhere, so ask before you shoot. Being on good terms with your local guides earns you great privileges like riding the metro system or visiting the water park. 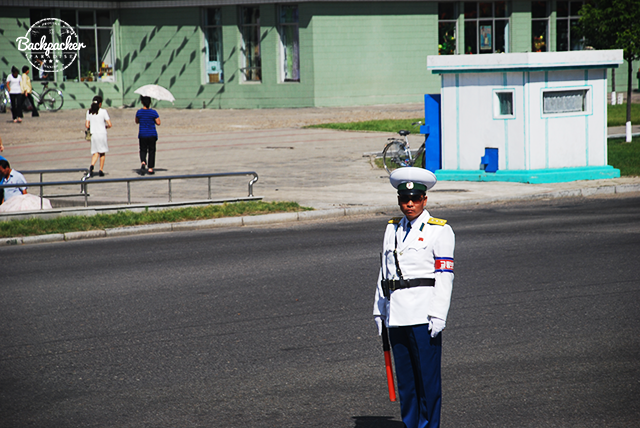 Leaving the DPRK you will most liking have your photos looked through by military personnel. You will feel uncomfortable as they enter your personal space, taking your phone with force and looking through everything. I left the country by train to China. I felt less violated than I did entering through the airport security check in Pyongyang. 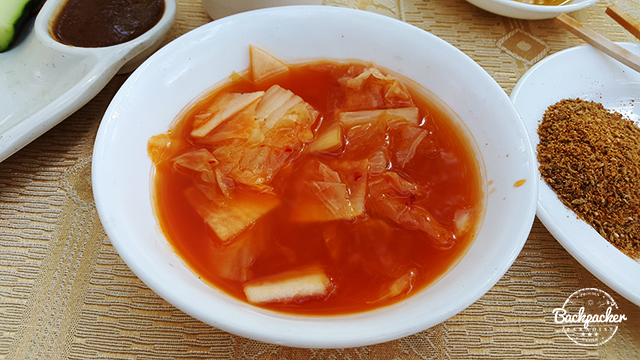 Kimchi is the national dish of DPRK. A perfect starter containing cabbage (or other vegetables) mixed with seasoning - often chili. 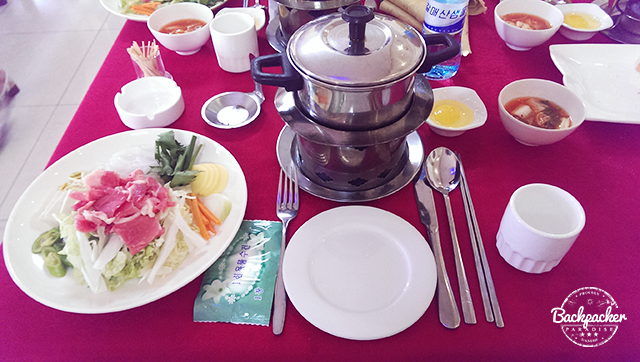 Korean Boiling Pot is a main course. Everything is raw. 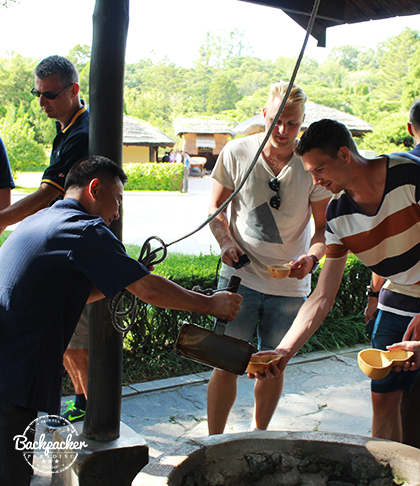 In front of you you have the boiling pot... Time to be your own cook! Add the meat and seasoning first, then the vegetables and last but not least and egg. Leave to simmer while you grab your chopsticks and start fishing things onto your plate. 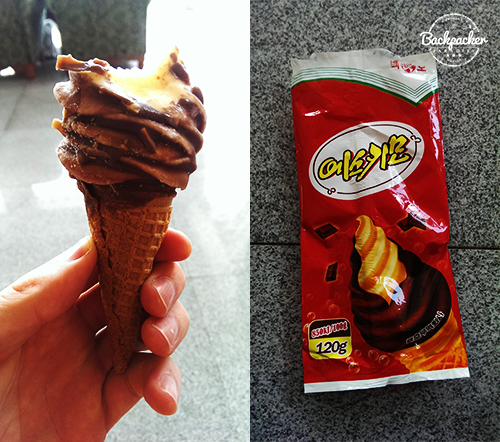 For dessert; Korean Ice Cream. Does not taste exactly like western ice cream. Seems like it contains less - or even no milk. Still tastes good on a bright sunny summer day. 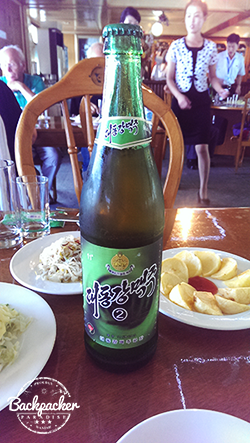 Taedonggang is a DPRK and state-produced beer brand. Tastes lovely together with some kimchi. 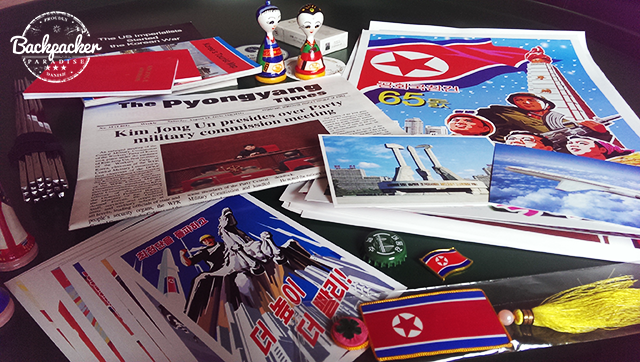 During your stay in DPRK the common places you visit will have small souvenir shops. Depending on the tourist season the range differs and some items might be out of stock (in the whole country). Some of the nicest souvenirs I got my hands on were some propaganda posters with violent and dramatic paintings showing the power of the DPRK military strength. Besides that I got a t-shirt with their flag on it, some handmade doll figures, a set of chopsticks, a magnet, a pack of local cigarettes, a local Pyongyang Times newspaper written in English, a stack of postcards, a few books, a pin and a bottle cap. One of the more exciting souvenirs you can get your hands on, is the DPRK currency also known as Korean Won. As a tourist and a foreigner however, it's illegal to possess and keep DPRK currency. There are a few ways of getting them, but be aware that whoever decides to trade you will be taking a huge risk. Buying the old bank notes is a possibility. Those are sold as a collector's set, but are not in use anymore, which makes them less exciting to bring back home. The easiest way of getting them, is by asking your local guide to trade you some (but you'll need to earn his or her trust first). Another way is to ask for won in the souvenir stores once you've paid and need some cash back. A lot of the cashiers however, will decline that request. A third option is to trade with some of the locals. That can be extremely tricky, as it's hard to get a private chat with a local and especially a local who speaks English. Congratulations! You've made it through the whole article. 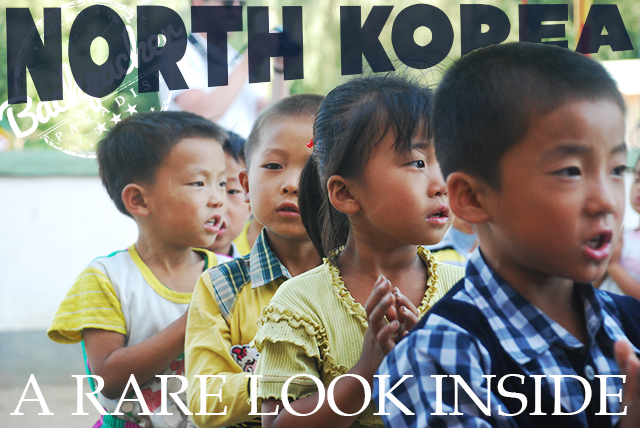 Now you can sit back and enjoy some video from my visit to the DPRK.